Raised Garden Beds Plans - Use our simple to follow step by step plans to build your very own raised garden beds at home. Cedar raised bed make gardening easier, more accessible, more economical, and more efficient. But often a cedar raised bed can cost hundreds of dollars. With this plan, I figured out how to create raised cedar beds - deep ones - for about $10 each. 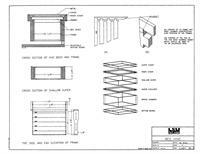 Plans To Construct A Simple Bee Hive. Author Lynn Hannaman, Category Bees. Multimedia and Publication page posted in Category Bees on September, 2005. Content intended for General Public, General and provided by the LSU AgCenter. Great vegetable garden design: Get our easy step-by-step instructions for building a raised bed for vegetables and other crops. Make a great planting box for your vegetable garden.